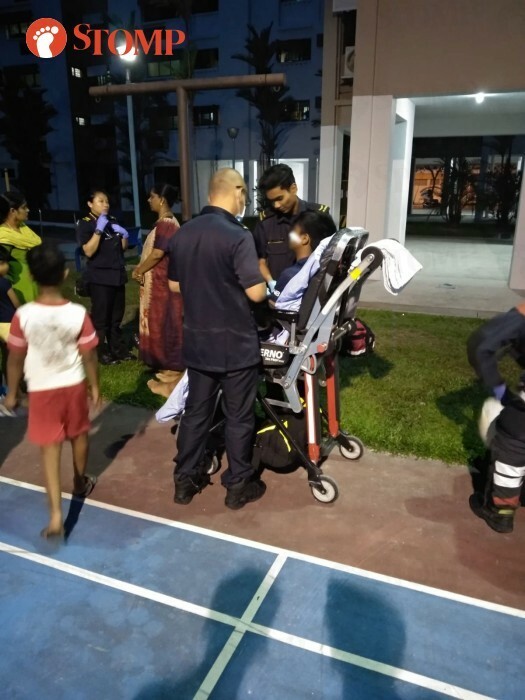 A 12-year-old boy was taken to hospital after he ran into a pole during a game of cricket at Block 640 Jurong West St 61 on Wednesday evening (Nov 7). Stomper Sriram alerted Stomp to the incident and shared photos he and his friend, Aryan, took from the scene at about 6.45pm. In the photos, their friend is being attended to by paramedics and has a white bandage placed on the left side of this face. "I was watching my friends play cricket when I saw one of them hit a pole hard in an attempt to save the cricket ball," he said. The group were playing cricket at a badminton court. The brown T-shaped pole the boy ran into is situated at the side of the court. "He was bleeding from his upper left cheek and lost consciousness for about five minutes," Sriram said. "At first I thought it was a small thing but when he didn't get up, several people ran towards him to help. "He was able to breathe normally and the ambulance and his parents were alerted immediately. "His mother rushed to the scene and the boy was taken to hospital via ambulance." The Singapore Civil Defence Force (SCDF) told Stomp they were alerted to the incident at about 6.50pm. Stomp understands that the boy was conscious when the ambulance arrived. The boy was then taken to National University Hospital.